Immunogen: Synthetic peptide corresponding to a portion of human Bak. 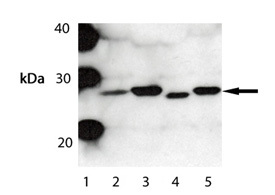 Western blot analysis of Bak (Prod. no. ADI-AAP-030). Lane 1: MW Marker; Lane 2: A431; Lane 3: CHO-K1; Lane 4: ESK-4; Lane 5: Vero cells. Immunohistochemistry analysis of human cervical cancer tissue with Bak pAb. Immunofluorescent analysis (confocal) staining of He La cells using Bak pAb (green); nuclei are stained in blue pseudocolor using DRAQ5.